Seeitnowsports.com in partnership with principle event sponsor HCIP Ltd have a sporting dinner with none other than global boxing icon Sugar Ray Leonard. 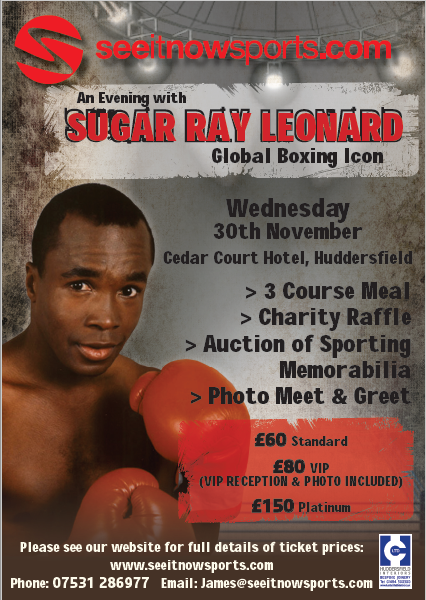 The dinner will take place at the Cedar Court Hotel, Huddersfield on November 30th. Guests of HCIP Ltd can expect a once in a lifetime opportunity to get up close and personal with Ray in the “Green room” during which they will get the opportunity to chat to Ray about his career. Guests will then attend a VIP reception with live music from upcoming vocalist Jodie Alexandra whilst having a professional photo taken with “Sugar” Ray. Guests will then enjoy a 3 course meal, live auction and listen to Ray talk extensively about his career including fights with Roberto Duran, Marvin Hagler and Tommy Hearns.